Did You Know? In scenes where Bellatrix and Voldemort are seen together, Bellatrix almost always moves to Voldemort’s right, the position reserved for the most leal follower. Quotables: DUMBLEDORE: Of course, it’s happening inside your head, Harry. Why should that mean that it’s not real? A Word from the Guise: I pretty much cry the whole way through this movie every time I watch it. The entire series has been building to this moment. And it does not disappoint. I was really sad when it only received 3 Oscar nominations; I had really been hoping for one for Alan Rickman for Best Supporting Actor. Not only did he play the role of Severus Snape for 10 years, but in this film we see a completely different side of Snape that we’ve never seen before, and Rickman played it heart-wrenchingly perfect. While I’m sure the Academy wouldn’t have nominated him anyway, as they have very little love for performances in fantasy/sci-fi films, I do still think that Warner Bros. kind of screwed the pooch on this one. They submitted 13 actors for Oscar consideration, eight of which were for the Best Supporting Actor category. And while all eight, indeed all 13, of the actors submitted had been part of the series for a very long time (most from the very beginning), I really think they should have narrowed down who they wanted to be considered. I had hoped that the very final duel would be depicted more closely to the book. 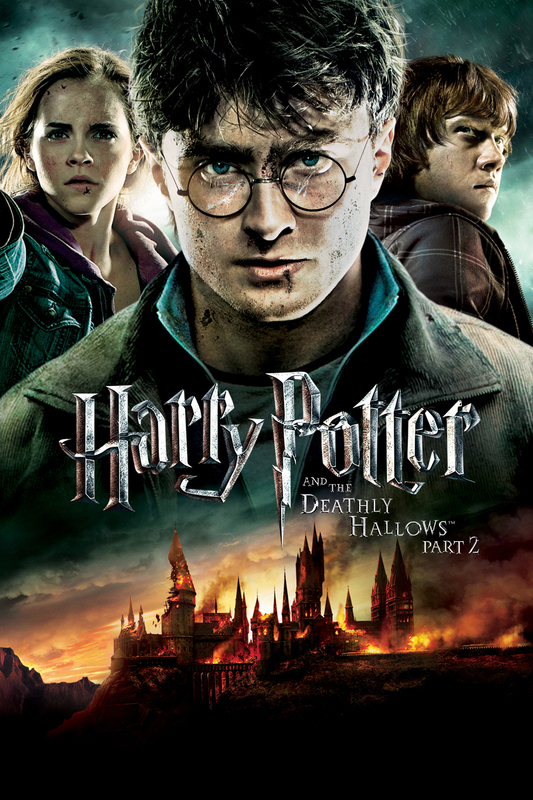 I wanted to see Hermione, Luna, and Ginny taking on Bellatrix, while Kingsley, McGonagall, and Slughorn dueled Voldemort. Then Mrs. Weasley steps in and kills Bellatrix, but not before the two witches combat each other viciously, cracking the floor of the Great Hall. Their fight was much too short in the film, but it was compensated by Ron and Hermione trying to kill Nagini so Harry can defeat Voldemort. And then BAM! here comes Neville to save the day! Pretty much everyone hated the way Voldemort and Bellatrix were killed in the movie, the latter being blasted into oblivion and the former disintegrating into ashes. And I was of the same mind the first few times I watched the movie. But now, I rather think I liked it. Bellatrix’s death at the hands of Molly Weasley is symbolic of how much stronger true love is than obsession. Her death in the film goes a bit further, showing us just how powerful Molly really is: she overpowers the strongest and most ruthless of Voldemort’s Death Eaters, hitting her with a Killing Curse so powerful that her body literally shrivels. Then for good measure, Molly hits her with another spell and she explodes into billions of pieces. It would have been very satisfying to have a body for Voldemort, but I think his film-death adds a touch of finality to the whole thing. It helps too that they built up to his death in this manner by making Voldemort’s skin become evermore brittle as it slowly flakes away with the destruction of each Horcrux. I can still understand, though, why many fans were angry with the way they killed the two biggest villains in the series. But I can’t understand the fans’ contempt for the epilogue. Many of them criticize the makeup on the actors, but I really don’t see what’s wrong with it. Compared to many other films who chose to use makeup to age their actors rather than cast older actors, Deathly Hallows: Part II does a brilliant job. Other films accentuate the wrinkles too much, darkening them to excess so that it’s painfully obvious that it’s makeup. But the makeup artists on this film chose subtlety in their applications, only adding hints of age, and the result is excellent. Indeed, I’ve seen a lot of comments saying that they should have just cast older actors in the roles for this scene, but I have no doubt that these same people would have criticized the filmmakers if they had opted for older actors instead of makeup. You can never please everyone, but I for one was very pleased with this final installment of my most favourite series.